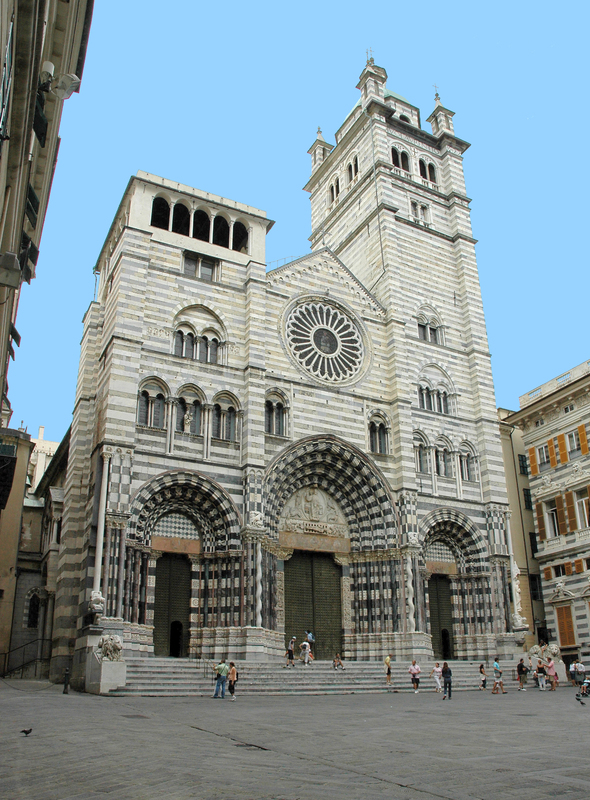 The most important church in Genoa is the Cattedrale di San Lorenzo. 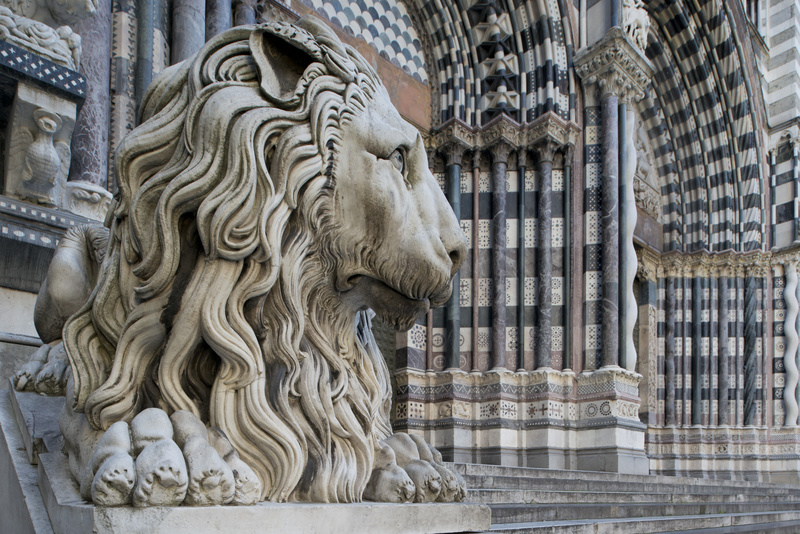 The Genoese cathedral and the artistic representations on its walls gave rise to many legends and curiosities. 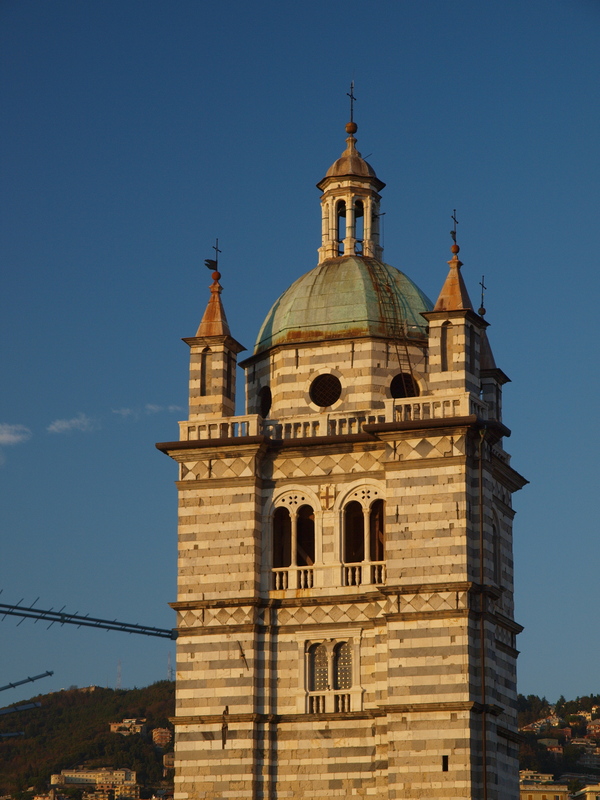 It was built around the year 1098 to support and then replce a sailica, which dated back to the 5th or the 6th century, and was later enlarged with solemn and precious forms. 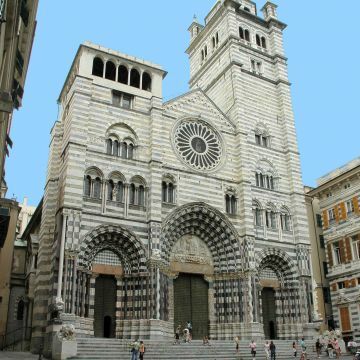 The cathedral is dedicated to San Lorenzo Martire and guards the ashes of the patron saint of the city San Giovanni Battista, brought to Genoa at the end of the First Crusade. 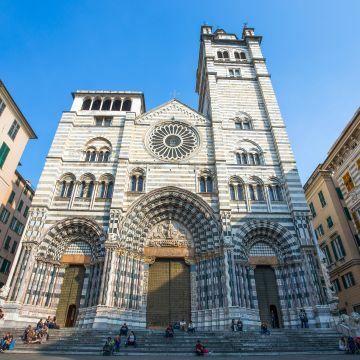 The basilica of San Lorenzo became a cathedral in the 9th century, replacing the basilica of the Twelve Apostoles, dedicated to the bishop of Genoa San Siro in the 6th century. In those times the building was located outside the city walls. 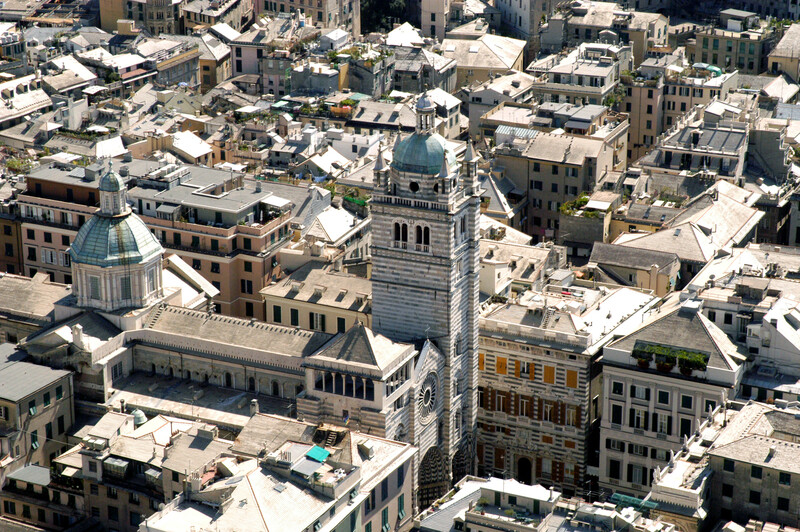 Thanks to the relocation of the cathedral and the construction of the walls, the area of San Lorenzo became the heart of the city, which grew and changed: in a city without squares, the parvis of San lorenzo offered a fundamental stage for the social and political life during the Middle Ages. 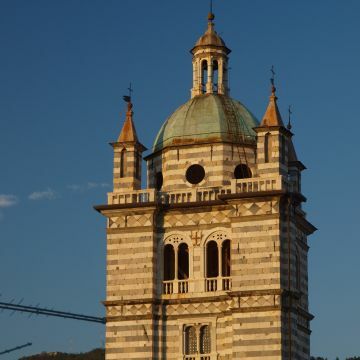 Papa Gelasio I consacrated the cathedral in 1118, when the reconstruction of the church in Romanesque style started thanks to the funds coming from city taxes, military ventures and Crusades. 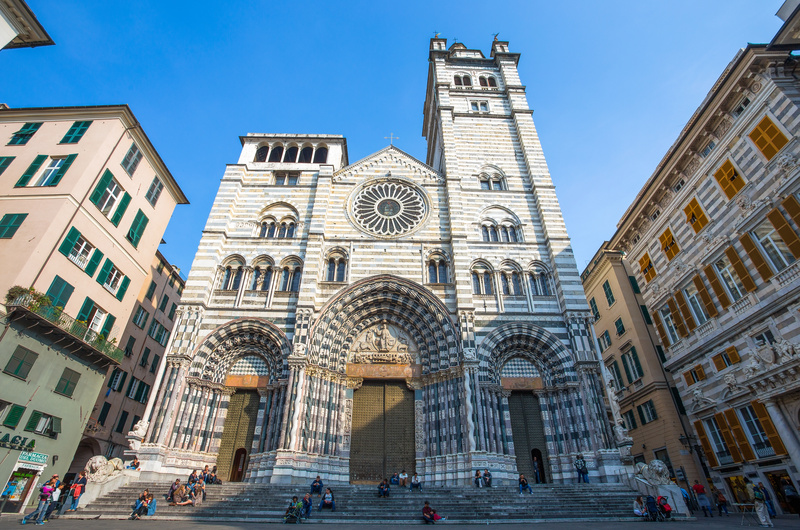 In 1133 the cathedral became the seat of the archibishop of Genoa. 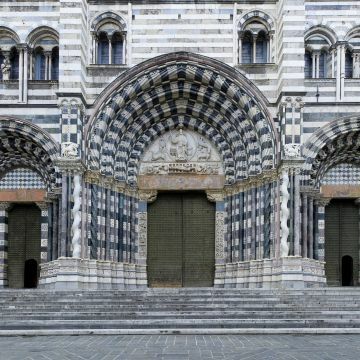 In 1296 there was a fire and after the incident the building was partially restored, the other part was reconstructed in Gothic style: between 1307 and 1312 the majestic facade with white and black stripes was completed, the counter facade was frescoed and the inner colonnades where restyled with new capitals and the addition of false matronea; as it often happened in Genoa, the well preserved Romanesque structures were maintained. 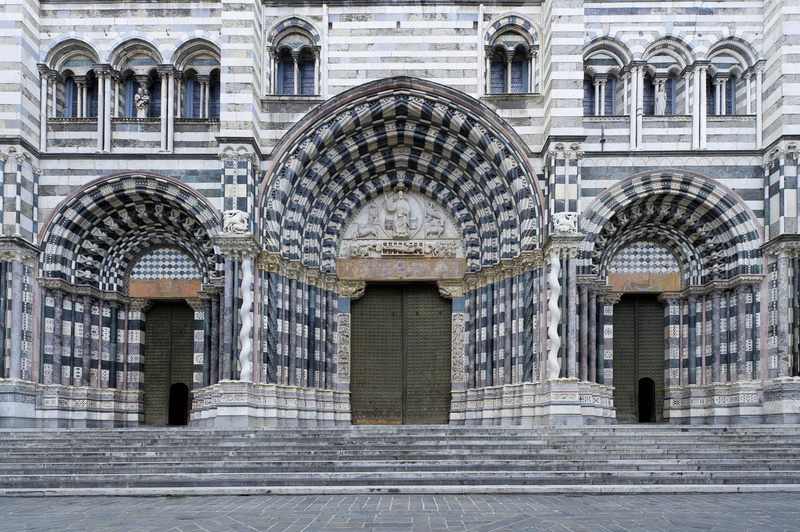 Between the 14th and the 15th century the cathedral was enriched with new altars and chapels, among them there is the splendid chapel in the left aisle, in which are guarded the ashes of San Giovanni Battista, a true masterpiece of the 15th century art. 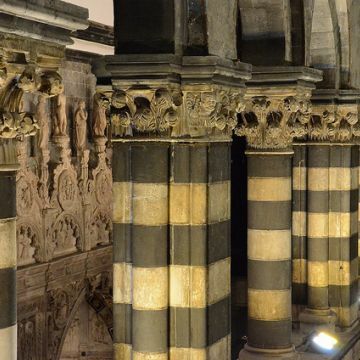 Meanwhile, in 1455 the small loggia in the north-east tower of the facade was built, and in 1522 the opposite one was added, folloqing the rules and shapes of Mannerist architecture. 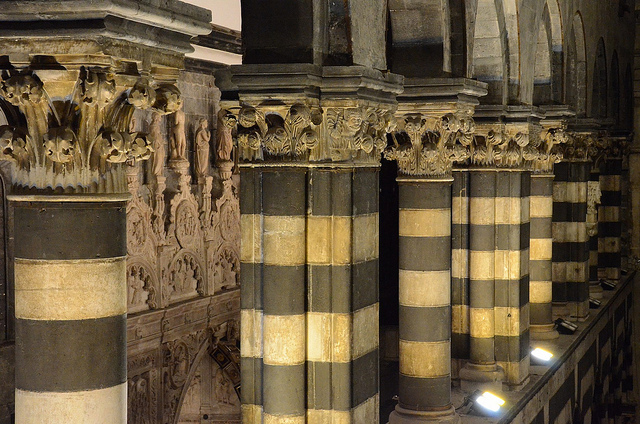 In the middle of the 16th century, on the instructions of the city judiciaries, the architect Galeazzo Alessi from Perugia redesigned the whole building, only succeeding in the reconstruction of the roofing of the aisles, the floors, the dome and the apse area. To finally be able to see the completed cathedral i twill be necessary to wait until the 17th century, with a triumph of gilded stucco which decorated the pase and the late Mannerist frescoes which represented the “Stories of Saint Lawrence” by Lazzaro Tavarone. A restoration at the end of the 19th century enhanced the medieval parts that currently characterized the aspect of the cathedral. A curiosity: to the undying memory of the horrors of war, inside the cathedral, in the right aisle, it has been preserved the exact copy of an unexploded bomb. 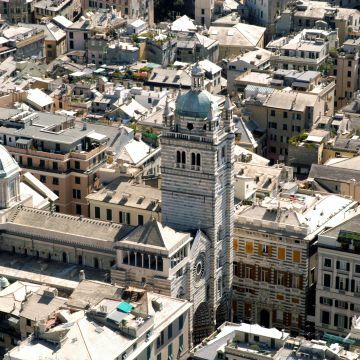 The grenade was shot in 1941 by the British Royal Fleet during one of the worst attacks against the city of Genoa during the Second World war. 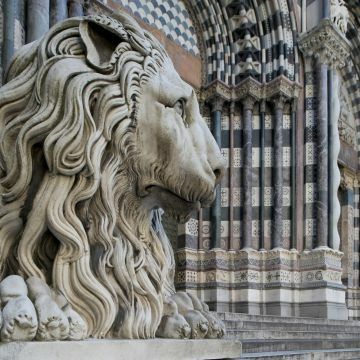 To complete the tour of the cathedral, we suggest not to leave out the Museo del Tesoro, that you can access from the inside of the cathedral and is located near the Museo Diocesano.